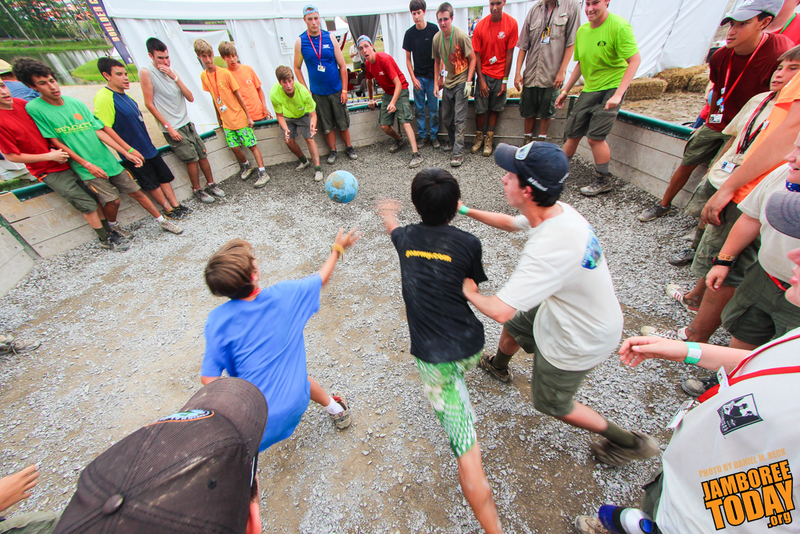 Scouts and Venturers dive for the ball as they play ga-ga, a form of dodge ball, near Goodrich Lake. Photo by Daniel M. Reck. "The best event was BMX biking," said Syvertsen, preferring the sculpted course to nature's bumps and dips. "It's so fun and really gets your adrenaline going. Racing around the track against seven other Scouts, and you're always on the verge of eating dirt." The Rocks were also a big hit, with options for both climbing and rappelling. "Climbing was really cool. I especially liked the auto-belays they had set up," said Life Scout Andrew Black. "I also enjoyed the Leap of Faith. It was choice." Star Scout Max Brodbeck got his kicks up at the the Barrels, home of shooting sports at the Summit. "I enjoyed shooting at The Barrels. The training took forever, but once I got to shoot a shotgun it was great," he said. "Once I pulled the trigger and felt the kick, it was totally worth it." From extreme bikers to your casual shooters, the jamboree's vast arrangement of activities offered something for every Scout and Venturer in attendance. Participants who couldn't take it all in are invited back to the Summit for the 2014 summer programs, which will feature shorter lines and longer activity times. And of course, all the fun will be back in concentrated form at the 2017 National Scout Jamboree. Contributor Nick Hessler is from Troop 21 in Mason, Ohio. He is very involved in the Order of the Arrow serving as the 2013 C6B section secretary and the managing editor for the National Order of the Arrow Communications Team. He hopes to pursue a career in journalism.